A common migrant, that we normally see floating leisurely in the sky during summer months. They migrate annually to central-east Africa for winter. See how small their feet are? Although they appear large, they only hunt prey like rodents, frogs and insects, but will also spend much of the day on the wing scavenging. 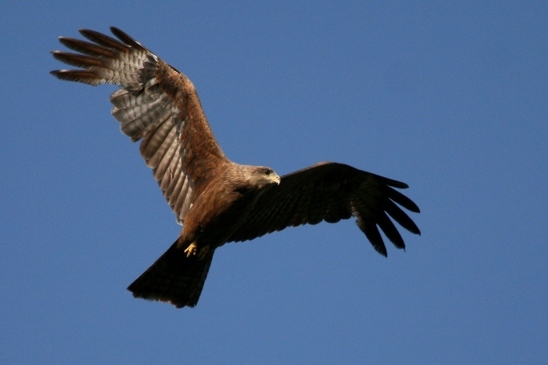 YBK (affectionately called Yibes) is an adult yellow-billed kite who flies in our shows. She is awesome in the air and makes the most of the easterly breezes that blow up the valley into the amphitheatre and glides merrily overhead catching her food reward on the wing. Luckily her stomach rules and she comes down when you bring out ‘the big piece’ of meat. She is certainly “all girl” and chats constantly, making it very difficult for her shy mate, Lelo, to get a word in edgeways. In the summer months her noisy talk often attracts the wild kites that migrate annually from central east-Africa and they join her in the air – to see what all the fuss is about of course!